Foggia is believed to have been founded by the inhabitants of Arpi, a town which declined in the third century BC. Foggia may have been named for pits or cellars used to store grain. It was a favorite of the Holy Roman Emperor Frederick II. In the thirteenth century it passed to Charles I of Anjou. 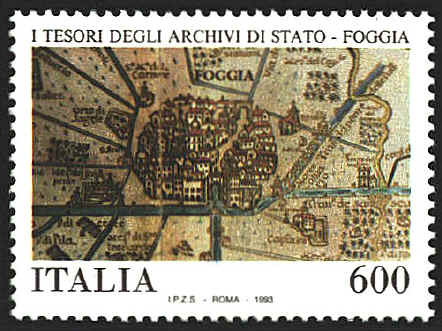 The plan presented by the stamp is based on a sixteenth century map in the state archives of Foggia. 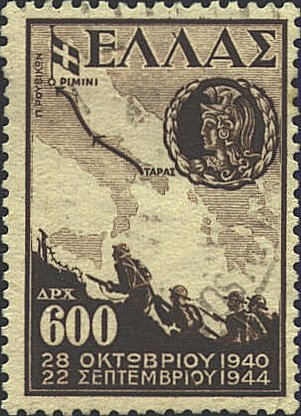 Greece issued a stamp in 1946 showing the campaign of Greek troops in Italy during World War II. The line from Taras to Rimini marks the route over which they fought from October 28, 1940 to September 22, 1944. The medallion shows a Greek warrior. The stamp featuring a map of Sardinia was issued in 1958 to mark the completion of the Flumendosa Mulargia irrigation project on the island.